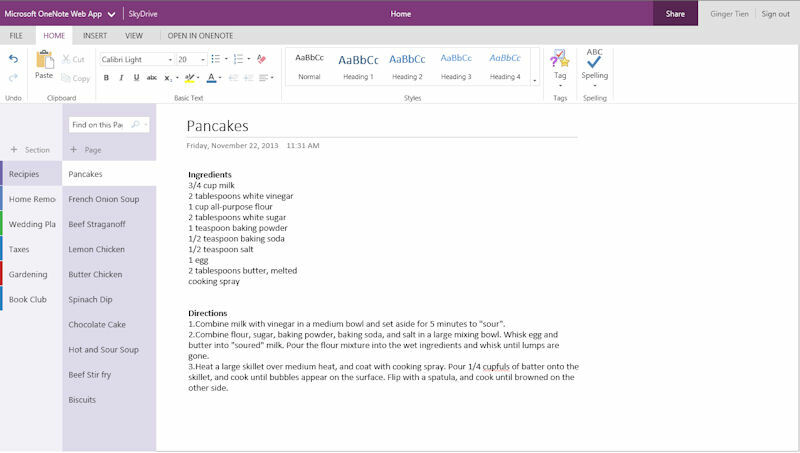 Microsoft today refreshed its OneNote website, making it easier for OneNote users to access their notebooks on the web. After signing in with a Microsoft account, users are presented with a list of notebooks that are stored in their SkyDrive, or that have been shared with them by another user. Any of the notebooks can be opened in the One Note Web app by following the relevant link. Previously, OneNote notebooks and the OneNote Web App were accessed through the SkyDrive.com website, which could be cumbersome as it required users to browse through folder listings to find the necessary files. The changes make for a smoother and more-obvious-to-the consumer multi-device OneNote experience. For example, a user can add content to a OneNote notebook on their Windows Phone 8 devices, then edit that same content from any Internet connected PC via OneNote.com, before reviewing the same content in the OneNote app on a tablet device. Given the nature of the typical notebook content, OneNote is arguably the Office app that benefits most from this multi-device synchronisation experience. Once a notebook is open, you might notice some updates to the OneNote Web App navigation pane. To make it easier to navigate sections and pages, we made some interaction and visual improvements to the navigation pane. Now there’s a column for your sections and a column for your pages. Both the improvements to the OneNote website and the updates to the OneNote Web App are part of wider series of updates to Micrsoft's online version of its key Office product offering. The online version of the Office apps are currently branded as Office Web Apps, but are expected to switch over to a Office Online branding in the coming weeks.